Window treatments of any kind serve a multitude of purposes. They can add to the ambiance and décor of a room; they can help control lighting by blocking or admitting sunlight; and they can even influence the temperature in a room by shielding the interior air from the influence of exterior temperatures. Can all window treatments do all of these? No, but wood blinds can. Wood blinds from Southern Shutters and Blinds in Georgetown, TX, are the multi-functional, attractive and affordable window coverings that are appropriate for any room in your home. Southern Shutters and Blinds offers actual wood as well as faux wood blinds, the affordable blinds Austin residents on a budget prefer most. For our genuine wood blinds, we used top-quality basswood. Basswood is a lightweight hardwood with a fine grain that has a barely visible pattern. With its creamy white coloring, basswood accepts a variety of stains, so you can choose the one that best complements the existing décor of your home or a specific room. In manufacturing, basswood is easy to work with whether by hand or machine. 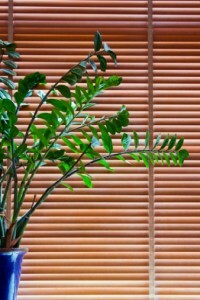 Wood blinds from Southern Shutters and Blinds come in two sizes of slats: two inches and two-and-a-half inches. The length, of course, is determined by the size of the window you want to cover. A three-inch decorative valance comes with each set of blinds for the finishing touch at your window. In addition to adding warmth and beauty to any room in your home, our wood blinds raise and lower easily with quality-constructed ladders and tapes. And with a quick twist of the wand you can let in the sun during the day or provide the security and comfort of a shielded window at night. Although faux wood blinds from Southern Shutters and Blinds are somewhat heavier than our line of genuine wood blinds, they offer the advantage of being more economical. The additional weight of faux wood blinds does necessitate a few more supporting ladders, but this in no way detracts from the aesthetic appeal of these window coverings. Faux wood blinds are mostly made of PVC that is designed to have the look and feel of naturally grained wood. Offered in two-inch and two-and-a-half inch slats, these horizontal blinds come in a wide selection of colors and embossed textures. 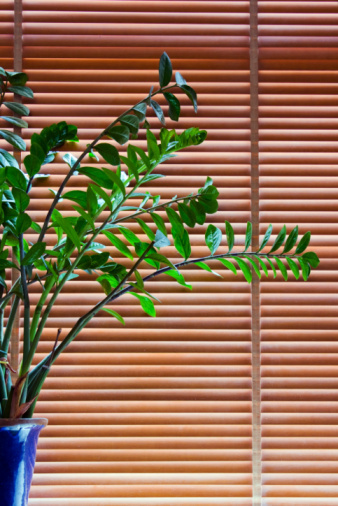 Whether you choose wood or faux wood, you’re certain to be happy with the lovely look of blinds from Southern Shutters and Blinds. If you’d like to learn more about how wood blinds can enhance the look of any room in your home, then call Southern Shutters & Blinds today to schedule a FREE In-Home Personal Design Session. Southern Shutters and Blinds proudly serves customers throughout Georgetown, TX, and Canyon Lake, Austin, Dripping Springs, Bee Cave, Burnet and Boerne and the surrounding communities.